Welcome to Staff Spotlight! Here we highlight the diverse stories of our valuable staff! Nadine, our Adult Program Coordinator & Naturalist Teacher, has been with us since 2014! Over my career I have completed an HBSc in Physical Geography and I recently just finished my Horticultural Therapy training and am now working towards my registration. I also run a small side gig called Penumbra Glassworks, making stained glass art. I love mixing art, science, and spirituality together, which combined have led me to the Nature Centre. I first began at the Nature Centre in the winter of 2014 as a volunteer with the after school program, Wonders of the Woods. I started my volunteering during a time in my life that was quite challenging. Coming here helped me to build new connections with nature, which was a wonderful healing process for me. Seeing the talented staff engage kids in something many of us take for granted sparked a new life-long desire to continue fostering these nature connections. Over my four years here at the Nature Centre, I’ve worked into my role as the Adult Programs Coordinator, where I’ve helped plan our backyard biodiversity speaker series in 2017 and wild bee buzz talks in 2018. I also plan our adult workshops, bat nights, and guided hikes for adults. As well, I assist with teaching school programs, children’s nature clubs, and summer camp! I’ve also helped coordinate our volunteers- you could say I’ve been a bit of a multi-tool around the nature centre. High Park is a true gem in the City of Toronto, I’m so glad I have had the privilege of spending so much time here connecting to this beautiful space and the people who use it. My goal in life is to be a healer. I want to help others who may be struggling find their independence, rebuild their identity, or simply find time to relax by spending time in nature. At the Nature Centre, a simple walk through the forest can be therapeutic. 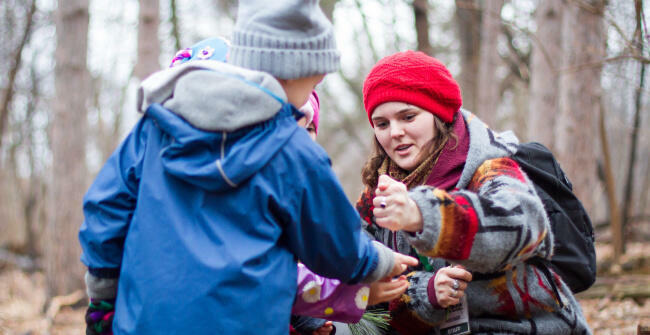 Children living in the city often don’t get to build strong nature connections, so I’m thrilled to have the opportunity to help foster this at a young age that kids can carry with them throughout their lives. When I’m not at work, you can find me hustling in the glass studio where I run a small side business called Penumbra Glassworks! I love playing with colour and shape and texture in stained glass and bringing this craft back from the renaissance. Collaborating with others to make custom pieces is a favourite thing of mine, but recently I’ve been preparing for an upcoming art show at Likely General on August 16th where my new body of work will be displayed which explores a series of psychedelic landscapes, prisms, and creatures. Check out the mini-bios for our other staff members on our Staff & Board page!